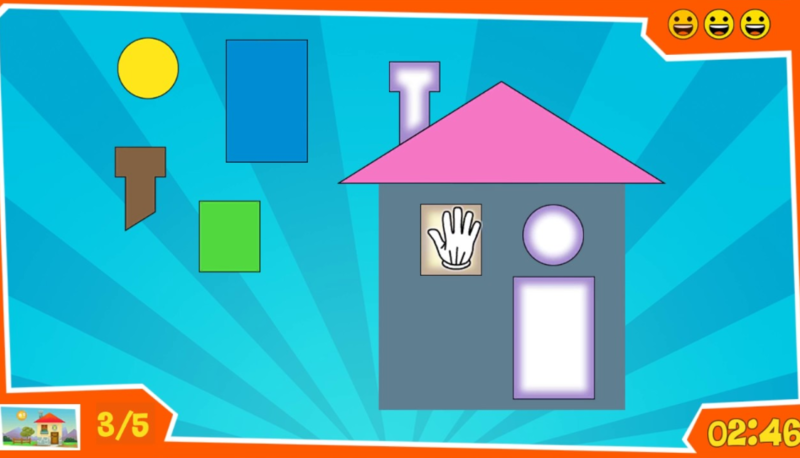 In the “Shape in Place” game, a child is asked to compose simple 2D shapes to form larger shapes and real-world objects by dragging a shape and dropping it at the appropriate slot. This coloured picture puzzle helps children expand their vocabulary and reinforces their ability to categorize and to place different shapes for creating wonderful real-world images, i.e. a boat, a van, a sky-rocket. When children attempt to position a shape in its place, it will only fit if it is properly put in the right space. The game can be made even easier by activating the “help option” meaning that the puzzle piece and the related position, where the piece goes, will be highlighted for few seconds thus guiding the child. It strengthens problem solving, concentration, and gross motor skills such as grabbing, middle-line crossing and hand stability.